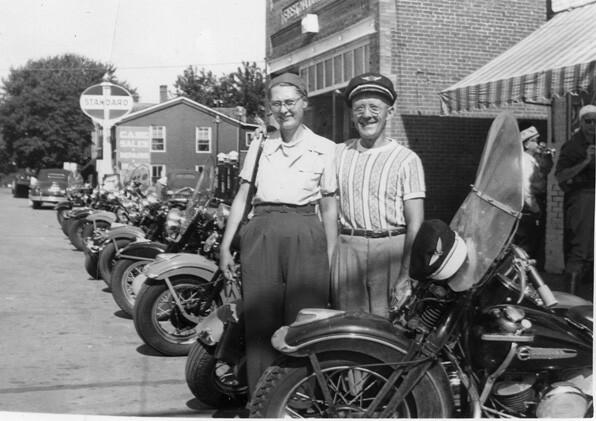 The Harley Shop features artifacts, collectables, photographs and vintage motorcycles as it showcases this iconic American treasure through the lens of a Hoosier family who has been in the business for almost a century. When George Schulteti began working for Harley-Davidson Motor Company in 1922, his first job was to sweep the floors of the factory’s service department. Later, he worked in research and development. Schulteti was also one of the company’s test riders. During World War II, he took inventory of all the Harley-Davidson motorcycles in military service and rode more than 50,000 miles per year. While Schulteti enjoyed his work at the factory, he wanted to become a dealer. Schulteti and a partner bought the Indianapolis dealership in 1947, and he and his wife, Ann, moved from Wisconsin. She was the office manager and worked the parts counter. The couple lived above the dealership at 701 S. Meridian St. Ten years later, Schulteti bought his partner’s share of the business. The family welcomed customers to that location for the next 51 years. 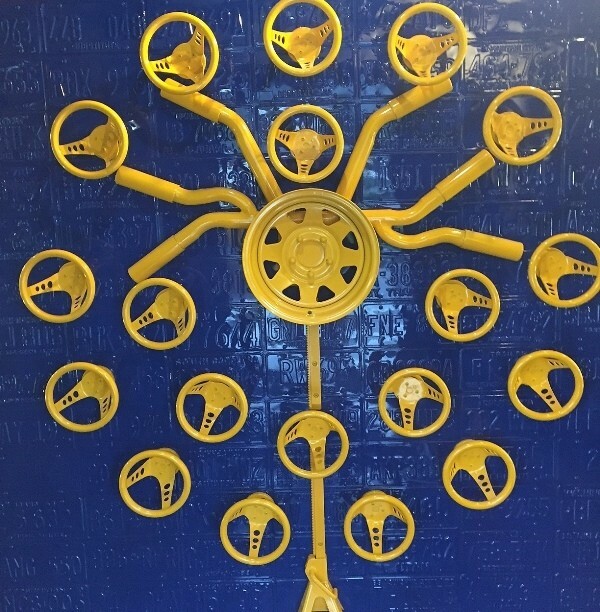 By the time the dealership moved in 1998 to its current location, 4930 Southport Crossing Place, the number of employees had risen from 17 to 32. Future plans include raising a fifth generation of the Schulteti family to carry on the tradition. 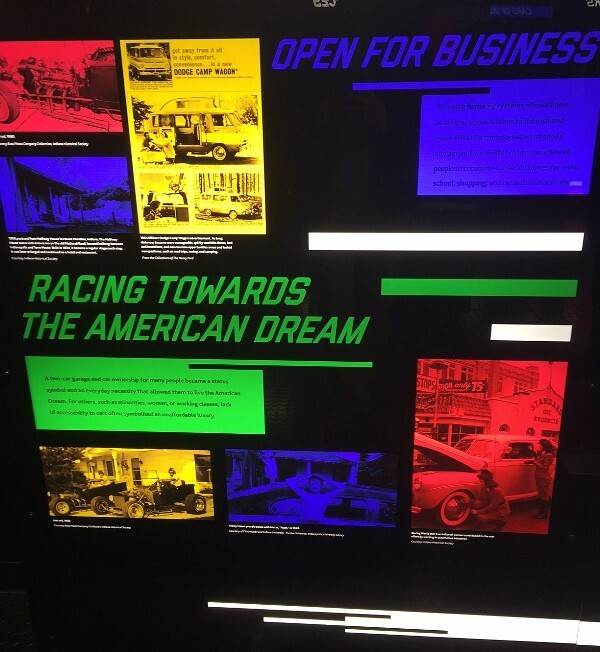 Guests can visit The Harley Shop during the History Center’s regular operating hours of 10 a.m. to 5 p.m., Tuesday through Saturday. Admission includes parking, which is available on a first-come, first-served basis. The Harley Shop is presented by Indianapolis Southside Harley-Davidson. For more information about the dealership, visit www.southsideharley.com. For more information about the exhibition or other IHS offerings, call 232-1882 or visit www.indianahistory.org. There are rightfully many tributes being offered about longtime Vincennes business and community leader C. James McCormick, who passed away earlier this week at age 92. We’ll share two related to the Indiana Chamber – where Jim, as he was known to all, may just have the longest tenure of any board member in the organization’s 95-year history – and our BizVoice® magazine. In 2006 Jim’s son, C.J. 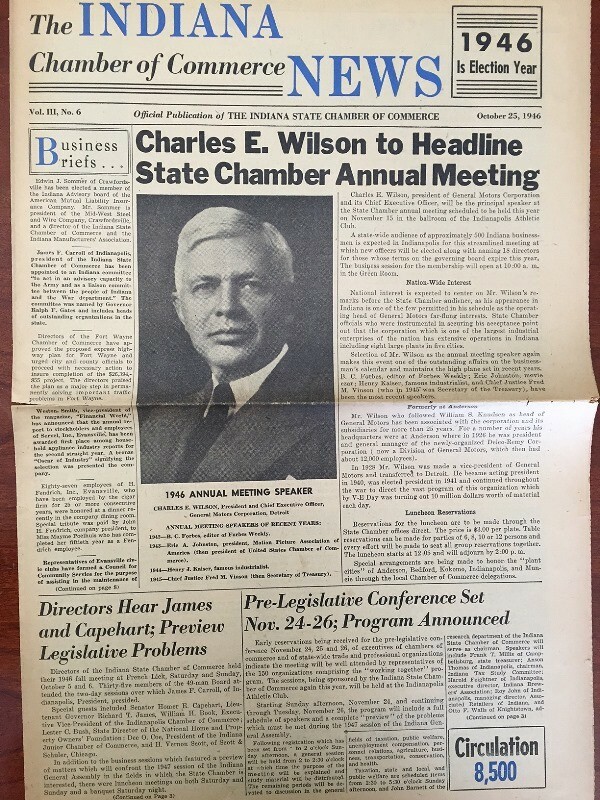 “Mac” McCormick III was going to be honored as the Chamber’s Business Leader of the Year when he tragically passed away in a plane crash 13 days before the Annual Awards Dinner. 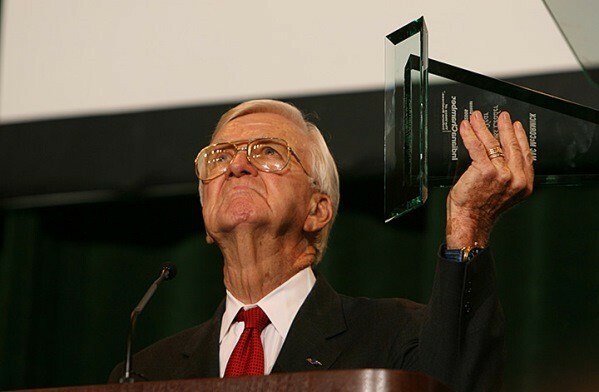 In an obviously difficult time for all, Jim agreed and wanted to accept the award on behalf of his son. His words of wisdom that night (see photo) served as both a tribute to his son and a lesson to all to live life to its fullest as Mac did. In a Chamber career that spans more than 19 years, the class of the McCormick family – led by its patriarch Jim – stands out as one of the most memorable moments. Jim, thank you for everything you did for your community, our state and everyone you came into contact with during your 92-plus years. Yours indeed was a long life well-lived. Flanked by Gov. Eric Holcomb and Indiana Chamber President Kevin Brinegar, Ann Compton regaled Legislative Dinner attendees with her stories about past presidents, and her opinions of President Trump and the media today. 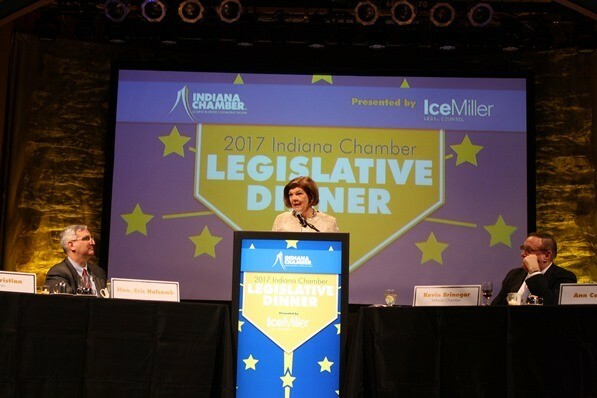 With more than 40 years of experience covering the administrations of seven presidents, former ABC News White House correspondent Ann Compton had plenty to share Tuesday night at the Indiana Chamber’s 2017 Legislative Dinner. On prior presidents and the media: George H.W. Bush originated the hat with the saying, “Annoy the Media: Re-Elect Bush” (Compton still has hers); Barack Obama “lashed out at the press” in a private, off-the-record session when he was not happy with the tone of the reporting. On the ultimate test for presidents: “They are measured by the crises they face.” Compton listed several, including the younger President Bush and 9/11, sharing personal anecdotes about that day as a result of her being the only broadcast journalist on Air Force One after the attacks. On Donald Trump: “This man is remarkably consistent (in style), but not necessarily on policy.” Noting that 30 years ago he didn’t carry a briefcase or schedule too many meetings, saying, ‘You can’t be imaginative or entrepreneurial if you’ve got too much structure.’ We’re seeing that applied today. The Legislative Dinner, with more than 700 attendees at the Indiana Roof Ballroom, was presented by Ice Miller, with Lifeline Data Centers sponsoring the opening reception. Gold sponsors: Eli Lilly and Company, NIPSCO and St. Vincent. Silver sponsors: Alcoa; American Chemistry Council; AT&T Indiana; Delta Dental of Indiana; French Lick Resort; Hoosiers Work for Health; Indiana Career Hub; IGT Indiana; Ivy Tech Community College; The Kroger Co.; Majestic Star Casino & Hotel; Old National Bank; Roche Diagnostics Corporation; Smithville; and Vectren. The 2018 Legislative Dinner will take place February 13. 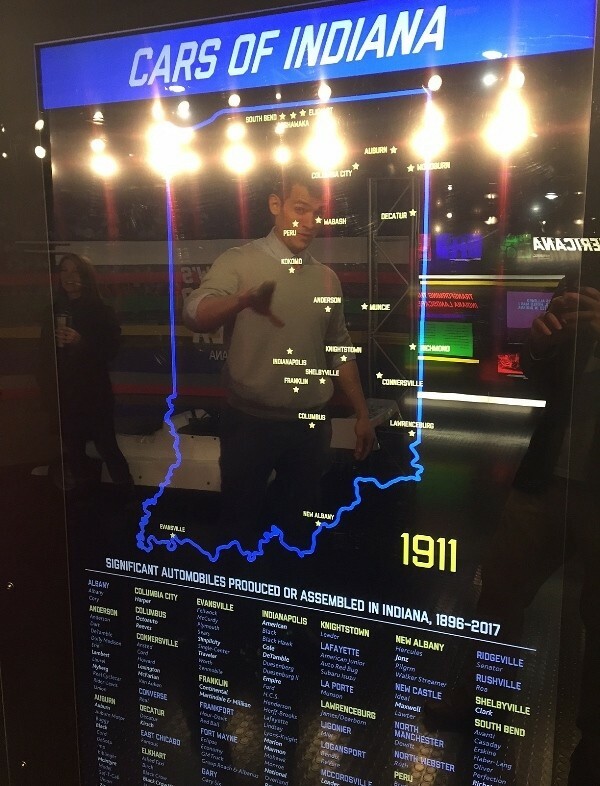 We highlighted the Indiana Historical Society’s Eli Lilly-themed You Are There exhibit in the January/February BizVoice. I’d just like to reiterate how intriguing and impactful these experiences are, and make you aware of IHS’s upcoming offering about Italian POWs at Atterbury in 1943, which opened March 4. In one of the Indiana Historical Society’s (IHS’s) most moving You Are There exhibits to date, visitors will be introduced to Italian prisoners of war in the chapel they built at Camp Atterbury—their home away from home. The exhibit, You Are There 1943: Italian POWs at Atterbury, debuts March 4, 2017, and runs through August 11, 2018, at the Eugene and Marilyn Glick Indiana History Center in downtown Indianapolis. In 1943, approximately 3,000 Italian POWs were held at Indiana’s Camp Atterbury. Today, this largely forgotten story from the Hoosier home front during World War II lives on as part of the camp’s history and through the descendents of many POWs. 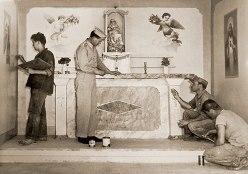 Guests to You Are There 1943: Italian POWs at Atterbury will step into a recreation of the still-existing “Chapel in the Meadow” as actors portraying POWs are completing paintings on the walls. In addition, visitors may interact with actors portraying American soldiers, including Chaplain Maurice Imhoff and Lt. Col. John Gammell, commanding officer of the internment camp. Outside the chapel portion of the exhibit, guests will discover the history and present-day use of Camp Atterbury through text and photographs. They will uncover the meaning of Italian iconography and see a slideshow presenting the various aspects of the POW camp experience. You Are There 1943: Italian POWs at Atterbury is presented by Jane Fortune and Franciscan Health, with support from the Italian Heritage Society of Indiana. For more information about You Are There 1943: Italian POWs at Atterbury or other IHS exhibits and resources, call (317) 232-1882 or visit www.indianahistory.org. 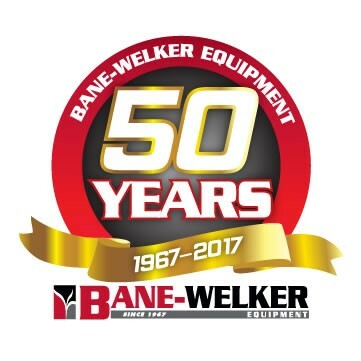 Bane-Welker Equipment, LLC is turning a half a century old this August. To mark the impressive occasion, the company is planning many events, sales and offers, as well as introducing a special 50th anniversary commemorative logo which customers will see beginning later this month. Kenneth Bane started Bane Equipment in 1967 when he answered the local newspaper ad from a representative for the JI Case Co., which was looking for a dealer in Montgomery County. By August of 1967, Kenneth and wife Patricia Bane, had signed the Case contract and the family business was born along with a commitment to superior products and service. Kenneth Bane passed away in 1999, but today, his widow Patricia, sons Phil and Jeff, and grandson Jason Bane continue the family business. 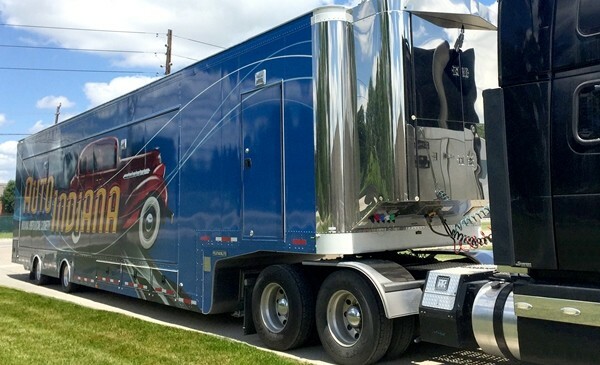 Bane Equipment became Bane-Welker Equipment in 2013 when Norm Welker brought his expertise to the table. He owned North Central Agri-power and merged with Bane to form Bane-Welker Equipment, LLC. Through the years, the company has seen many changes, including great advances in technology. BWE has committed to being on the cutting edge of that new information to ensure the success of their customers. Bane-Welker Equipment also remains committed to superior products and service. Follow Bane-Welker on Facebook or Twitter to stay up to date with everything related to the 50th anniversary. Bane-Welker Equipment is an agriculture equipment company representing Case IH and other complimentary brands. Bane-Welker offers new and used equipment, parts, sales, service, precision farming, online parts sales and customer support. 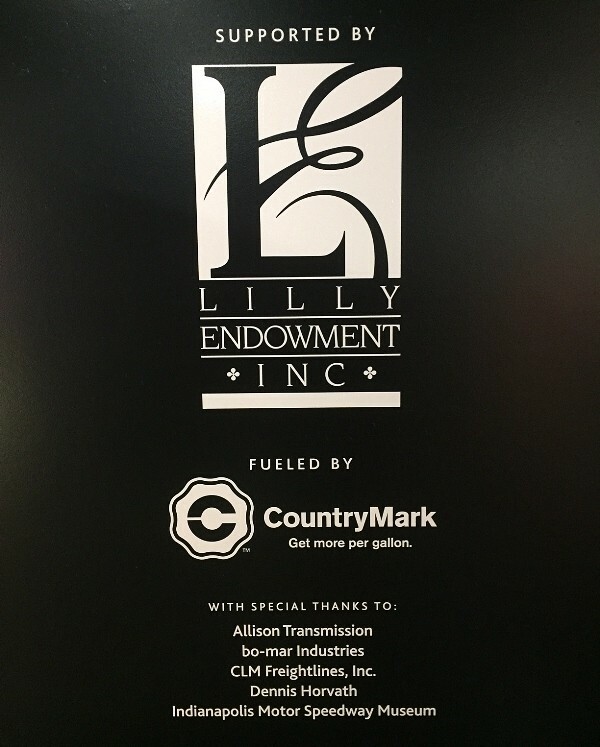 The 50-year-old company operates 10 stores in Indiana including Crawfordsville, La Crosse, Lebanon, Remington, Terre Haute, Pendleton, Plymouth, Winamac, and Wingate, and three stores in Ohio, including Eaton, Wilmington and Georgetown. 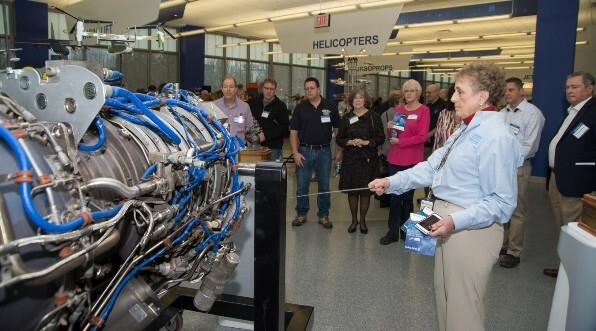 Rolls-Royce Heritage Trust Allison Branch volunteer and retiree Betsy Spencer shows visitors an AE 3007 jet engine on display at the new, reopened museum in downtown Indianapolis. The Rolls-Royce Heritage Trust – Allison Branch is reopening the James A. Allison Exhibition Center at a new, modern downtown Indianapolis location. The nearly 6,000 square foot facility, located at the Rolls-Royce Meridian Center office, 450 S. Meridian Street, will display an amazing collection of exhibits, and demonstrate a great deal of pride in Indiana’s past, in powering thousands of civil and military aircraft and ships. Using technology and hands-on displays, the Exhibition is designed to engage and inspire youth to pursue aerospace careers. Visitors to the Exhibition Center will see a collection of jet engines and other equipment made in Indianapolis that power today’s and yesterday’s aircraft – including engines that power C-130J Super Hercules; V-22 Osprey; Global Hawk; Citation X+s; Embraer ERJ jets; various commercial helicopters; and historical engines such as the Allison V-1710 that powered the legendary North American P-51 Mustang, P-40s, and other aircraft. A Rolls-Royce LiftFan®, which provides unique vertical lift capability for the F-35B Lightning II, is also on display. 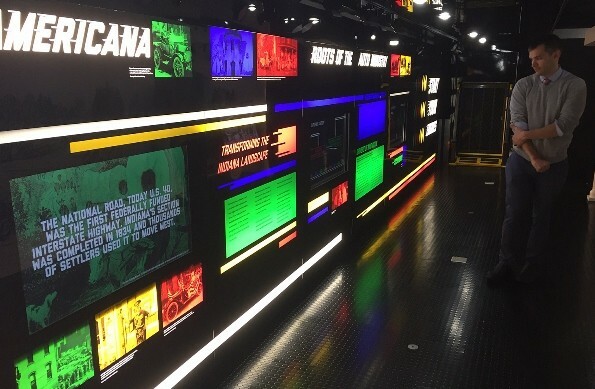 In addition to static displays, each exhibit zone is accompanied by an interactive video module with historic, technical and graphical information of the engines. 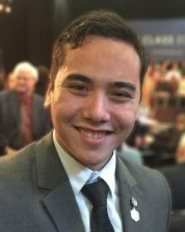 Science, Technology, Engineering and Mathematics (STEM) content is incorporated to help guide educators and students through advances in aerospace engineering. 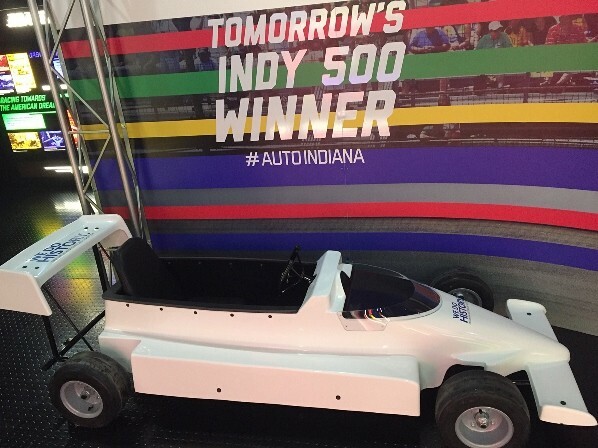 “Since opening our first science and technology exhibition in 1954 – then called Powerama – to citizens, customers and employees, we have believed it is important to show the legacy of more than 100 years of amazing power and progress here in Indianapolis. We also aim to provide visitors a glimpse at our future for the next generation of scientists, technologists, engineers and innovators,” said David Newill, President of the Rolls-Royce Heritage Trust – Allison Branch. Larger groups of more than 6 people wanting to visit the Exhibit must register on-line at www.rolls-royce.com/HeritageIndy. The Exhibit is free and open to the public Tuesday-Friday from 10 am to 3 pm. Donations are accepted and help the organization build new exhibits. 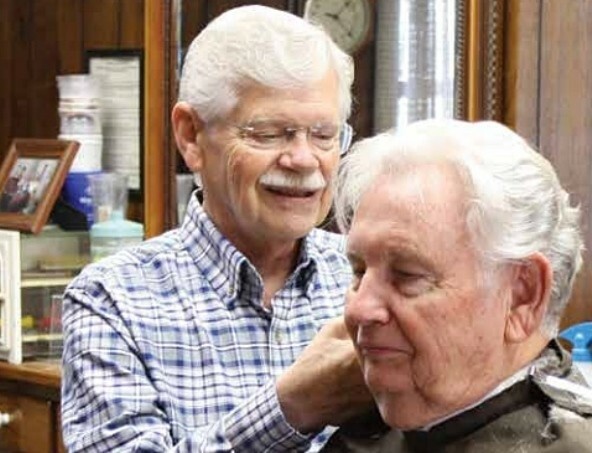 Roanoke barber Rex Otttinger has seen it all – a steady stream of loyal customers, an unruly flood and leaner times during the long-hair trend of the 1970s. And feel free to sleep in his chair, but interruptions like phones and TV are no-nos at this barber shop. In fact, Ottinger has never had a phone in the store – and never will. Read about this Huntington County success story in the new BizVoice. Note the circulation of the publication as reaching 8,500, so it’s encouraging to see we had a broad reach back then, just as we do today.